Known as the Picasso of celebrity trainers, Danny Musico can paint the body any client envisions on them. It’s no wonder he has been asked by Bruce Willis and Clint Eastwood to help them train their stars. His Beverly Hills gym has had the sweat of Sylvester Stallone, Hillary Swank, and Demi Moore, and athletes such as the Rams football players undergo his interval training program based on the principles of boxing. Boxing got the ball rolling for his training career. Musico’s boxing titles show his “get it done” mentality. Talk about resiliency - Musico achieved his IBC Super Middleweight Champion title after a paralyzing New York taxi cab accident. He looked at the doctor who told him no more and said, “You don’t know me”. His training methods involve interval work which is customized for each client based on their injuries, fitness levels, and what masterpiece his artwork of the body needs to portray. For example, a client might do 3 minutes fast on the treadmill, head over to the chest press, and then continue this intensity in order to burn fat. He generates this level of explosiveness from the average client who walks through his doors the advanced athlete, and the celebrities he trains. Musico’s calling for training actually came from a request by Bruce Willis. His first client was Demi Moore for her role in G.I. Jane. This was the start of his career after boxing. His job well done led to another call, this time from Clint Eastwood, who needed to get Hilary Swank ready for Million Dollar Baby. Musico initially said no because he wanted to focus on his own training again, but it was his mother who said he would be foolish not to take the opportunity. On 2 conditions Musico accepted: the first being that Eastwood have dinner with his parents and the second being that they work out in New York where he was training at the time for his own fighting. Some 18 months later, after 8 or 9 hours of training per day, Eastwood took Musico’s parents to dinner, celebrating the movie’s Oscar nomination. Musico said that it was Swank’s open canvas that allowed him to teach her all the mannerisms of a boxer, even the walk and talking with the hands, that led to the successful role. His philosophy is that boxing can apply to any client’s needs. Hand-eye coordination is beneficial for any athlete, and the speed and endurance of boxing challenges the cardiovascular system. At 49 years old, Musico is also a motivational speaker. He understands that the body is never 100% and everyday demons from lingering injuries are present for most clients. But you have to “get it done,” which is actually his trademark slogan. His new clothing line from Hylete will hit stores with the motto on every piece. His motivational speaking demonstrates his appreciation for life after his accident and his drive to be successful and prove that he can change people’s lives. He has many endorsements that he incorporates with this training including from Celcius and BioSteel. Moving forward he has partnered with the LaTerra development group and is currently selecting elite trainers to run his facilities. This is a “turn-key” opportunity to work with the celebrity trainer. This Italian puts the 1-2 punch in training to get results. His artwork of celebrity clients’ results speaks for itself, even when the camera adds 15 pounds. From the average person, model, athlete or celebrity, if you want to “get it done” step into Danny Musico’s ring. OnFitness Magazine, articles on fitness and health from experts on fitness. 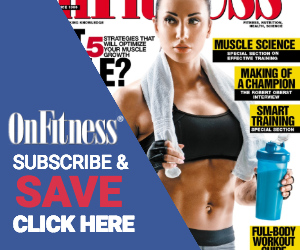 Subscribe to OnFitness Magazine and save 25% off the single issue price.